Cole and Bess Warner arrive with their children in Greyhill, the small Virginia town of Cole's childhood, to take over the family business. Bess, who is described by some of the locals as that "chubby woman who used to work in the White House," is unsure they made the right decision. True, she loves the historic Dutch Colonial house they live in, but there's that nagging, media drenched, career-ending White House scandal she dragged along with her. Everyone in town is sure to know about it. And then there are her in-laws. Laid back Bradley and meddling, fussy-to-a-fault Diane, right across the street. Nevertheless, fitting into the old money town where rumors fly like dried leaves in a windstorm is a challenge that Bess accepts in exchange for the long, stressful hours of her former job. Greyhill men join in with the catty, supercilious women who constantly buzz with unsubstantiated inuendo about everything and everyone, but especially about the newly arrived Warner family and the eccentric town matriarch who is threatening to sell her land to developers. "I grin and smile, grin and smile, noticing how some of the guests' eyes linger on me and how a few, farther back, thinking they're outside my sight line, tilt their head toward each other and whisper. I keep smiling. I say hello." "Her eyes are big—heavy, like a camel's—but perpetually watery. . . . I am trying to keep an open mind about her, but she doesn't make it easy. Part of the problem is that I know she is the woman responsible for taking my husband's virginity . . ."
So Bess isn't above a little churlishness herself. Later on, her daughter Livvie gets caught up in some adolescent mean girl vibe that is later amplified in the telling by the other mothers. But you'll surely sympathize with Bess when she finds out that Cole shared some private family business with Eva. 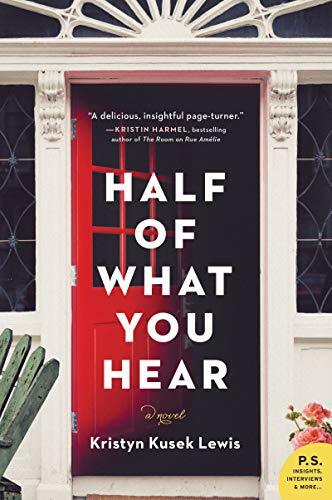 Half of What You Hear is a character driven, dishy, fun read that could be seen as a cautionary tale about the evils of assumption and gossip, but in fact it's a fairly mellow narrative. There are no fireworks, and the deep dark secrets that are eventually revealed aren't all that dark. Livvie's deliberate mean girl stunt is just about the worst thing that happens. Deliberate is the key word here as opposed to thoughtless, tactless, accidental, or misunderstood. Missing is an oh-my-god ending. Plenty of secrets are told, but none are explosive or particularly shameful. Most revolve around misunderstood events that happened decades ago, the speculative versions of which are way more despicable than the actual truth. That may be the point the author is making. "Eva puts her hand on Cole's shoulder and throws her head back at this apparently hilarious memory. '. . . you know that's his favorite pie,' she says, bending a wrist toward me as if I need to be filled in on the likes and dislikes of the man I am married to." Readers who find this book shelved in the mystery section of their local bookstore will be disappointed. It's not a mystery in the traditional sense. There's enough suspense to keep you reading, but for the most part, it's mild. Many readers will find the family secrets, which are revealed right up to the last chapter, are no more dishonorable than secrets they might be harboring about their own families. And Bess's White House scandal, though grounds for dismissal because of her particular circumstances, is far from a matter of national importance. A fine story that will move readers to look for other books by this talented author.